A lot of friends might have drawn flowcharts with Word, PowerPoint and Visio etc., and felt them quite hard both for using and installing. Actually with Edraw, drawing a flowchart can be very easy, you can learn to use it in three to five minutes. Click here to free download Flowchart Software. Then you can use the built-in symbols to make and present your flowchart rapidly. 1. You click to open Edraw Flowchart software, choose basic type of flowchart. 2. Choose one suitable template or example, double click it to start drawing a flowchart. 3. Choose suitable symbols from shape and symbol collection in the left toolbar. Select one symbol and drag it to the center of the drawing page, then you complete the first graph. Copy the same way to draw more graphs. 4. Click "Connector" tool on Home Toolbar, and move your mouse to the center of the first graph, hold and drag the mouse when it turn to connecting state, then you draw the first connecting line. 5. Continue to hold and drag the mouse to the second graph and drop it, thus, you build up a connection with the first graph. 6. You can directly select one shape, and click arrows around it to build up connection automatically. 7. If the second shape is not the same model as the first one, just click the second shape and change its property by quick setting button. 8. Reference line can help you to position shapes in moving process. 9. You can set Fill Color, Border Color, Line Model etc. with graphs and connectors in flowchart. Edraw can create very complex flowchart, add hyperlink, note and attachment to symbols, which is really helpful in dealing with complicated processing. 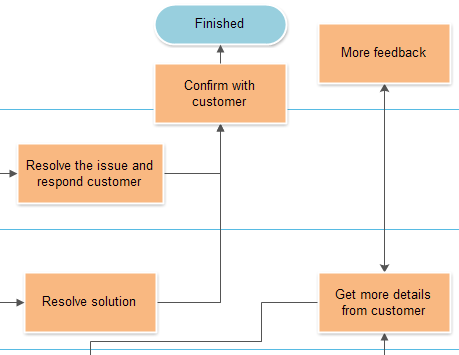 It also provides other models of flowchart, for example, cross functional diagram, work flow diagram and business process diagram. A variety of flowchart symbols and examples can help you draw flowcharts in easy and highly-efficient way.